When we think of cathedrals, we often picture the buildings and not the gardens around them. 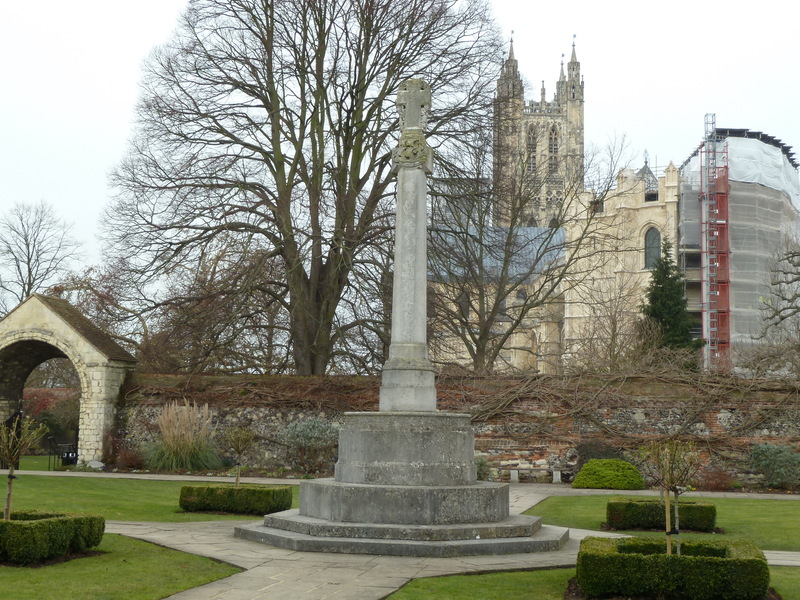 But Canterbury Cathedral, although smack bang in the middle of the city, is actually an oasis of calm and green – even if it is, as it was on the spring day I visited, absolutely freezing! 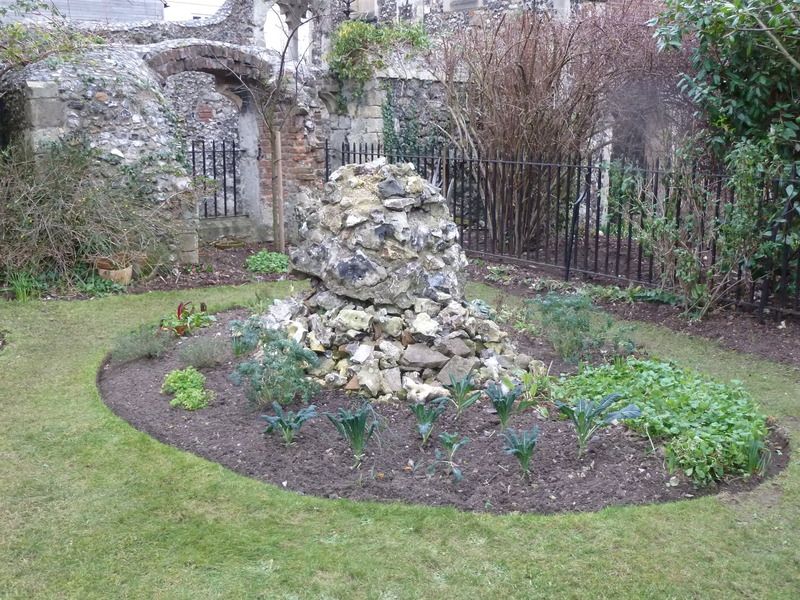 As well as the public grounds, there are five private Canonical gardens which add to the feeling of space, and which are opened annually for charity – it’s well worth looking out for this very special event. 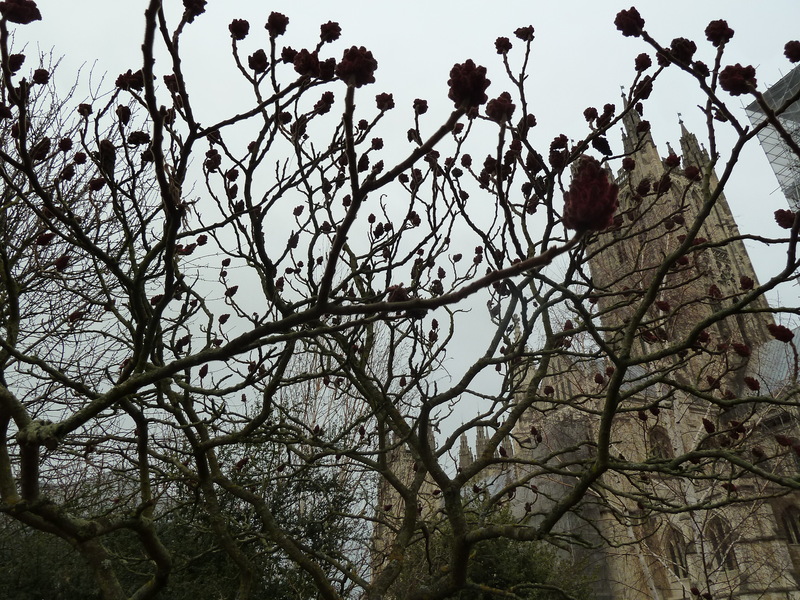 On my visit I was lucky enough to be taken around by the Cathedral’s events assistant, Jocelyn Prebble, and to meet one of the gardeners, Peter Dee, who reminded me all over again that people are what matter – even with historic buildings. 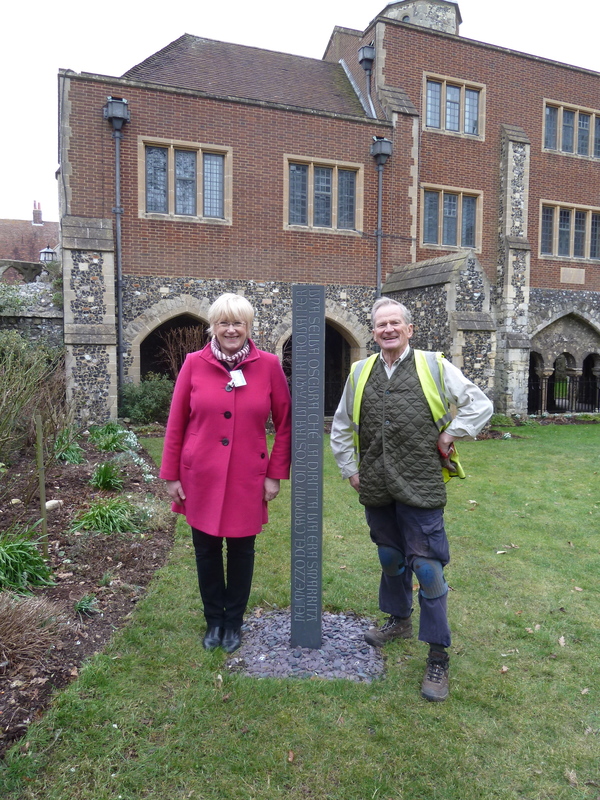 Here they are with one of the poetic statues that can be found in the grounds. But I was there to write my own words. And so I made notes and took photographs as we walked round. 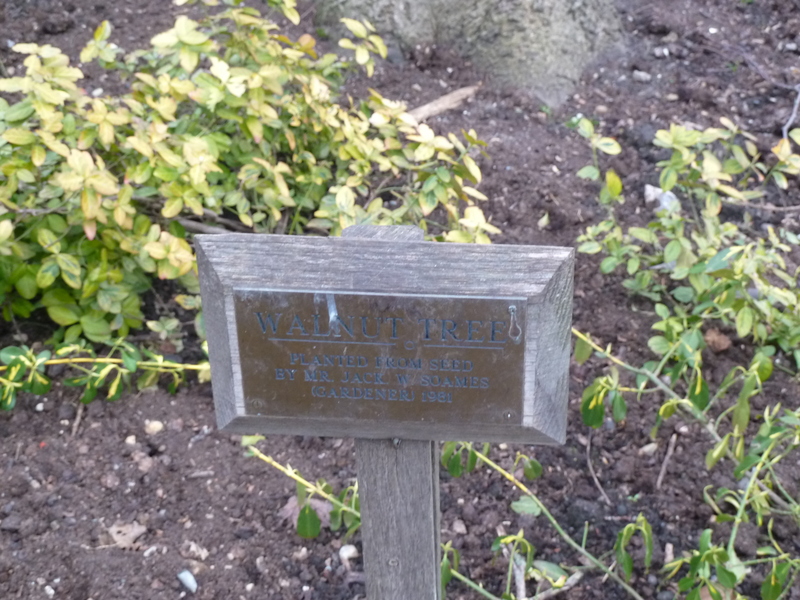 At first, I was taken by this plaque near a walnut tree in the Campanile garden. What a wonderful act of faith it seemed to plant a walnut seed. But how well it had been rewarded. 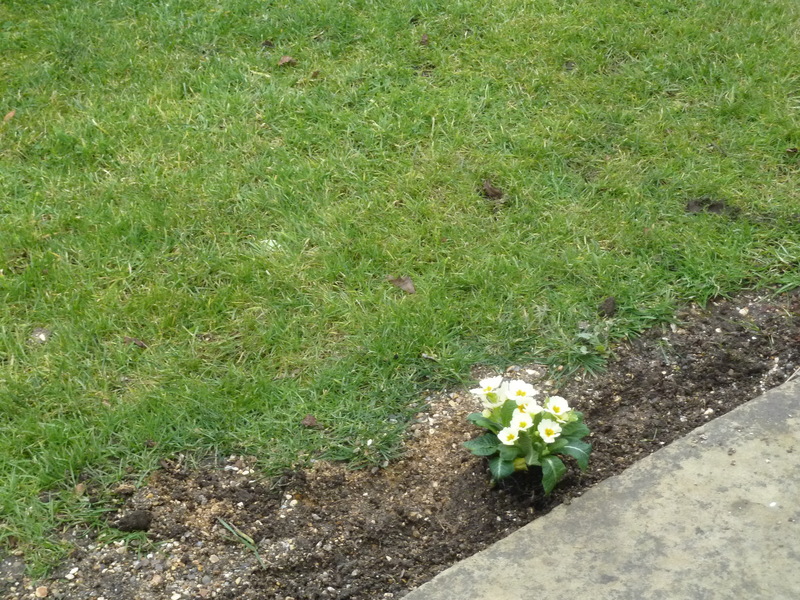 And then there was this primrose I spotted which had obviously been deliberately planted although it spoilt the otherwise formal shape of the Memorial gardens. I couldn’t stop thinking about who had put it there; was it an individual expression of grief amongst the collective memories? And then what was the story behind this seemingly random pile? 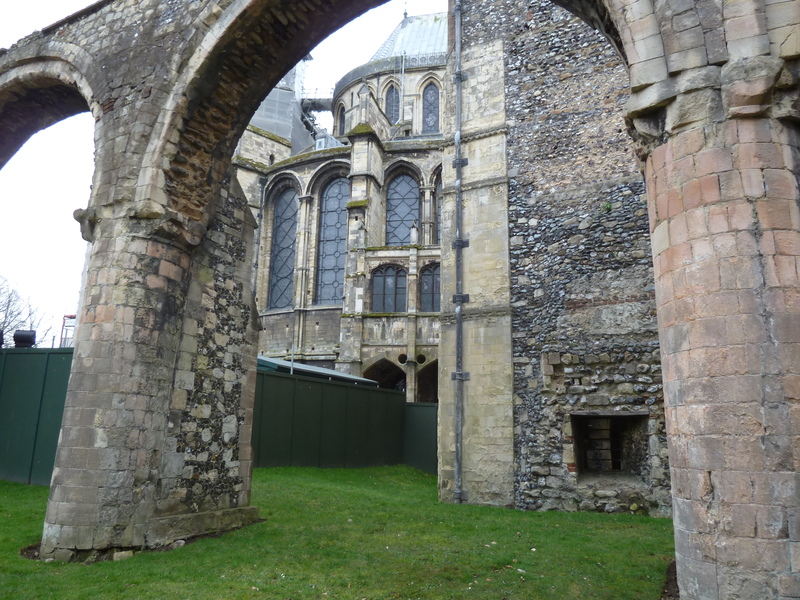 Just how many paths, doorways and passages (even now hidden ones) are there in the Cathedral precincts? And who has used them over the years? 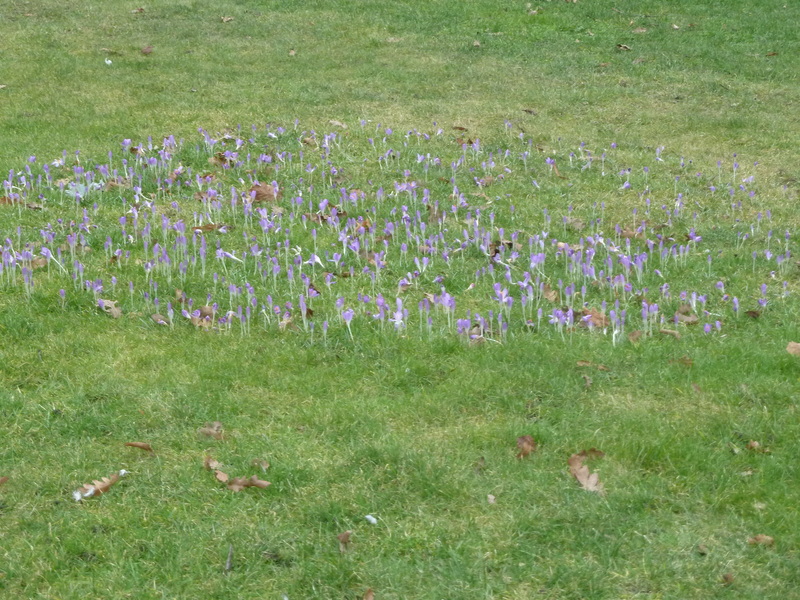 And why had this perfect crocus circle been planted in an otherwise plain piece of grass? Ah, looking up at the Rose Window, it became clear. The flower circle is exactly the shape and distance of where the window would land if the tower fell. 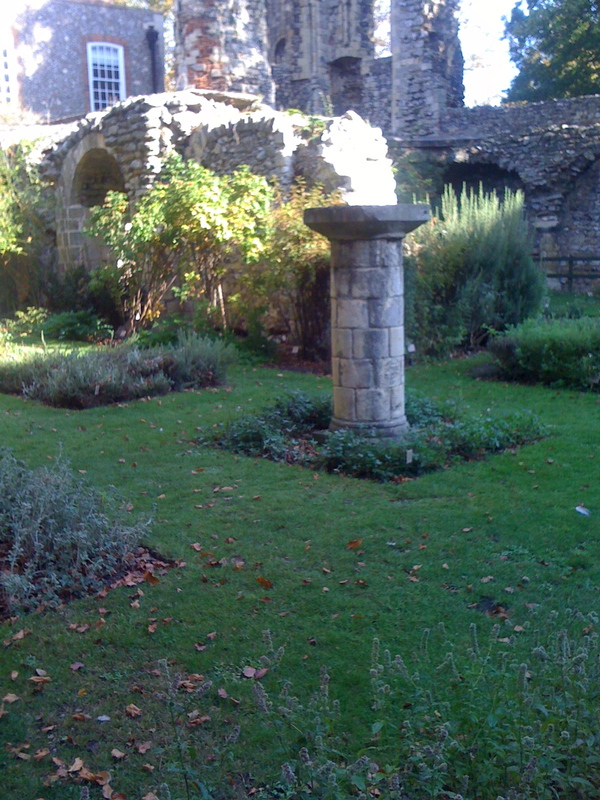 And as you’ll see from the photograph above, when I visited there was quite a lot of building work going on and the herbarium was shut, but I remembered just how much of a sanctuary it was from a previous visit, with places to sit near the herbs and healing plants both hidden and protected by ruins and Cathedral walls. 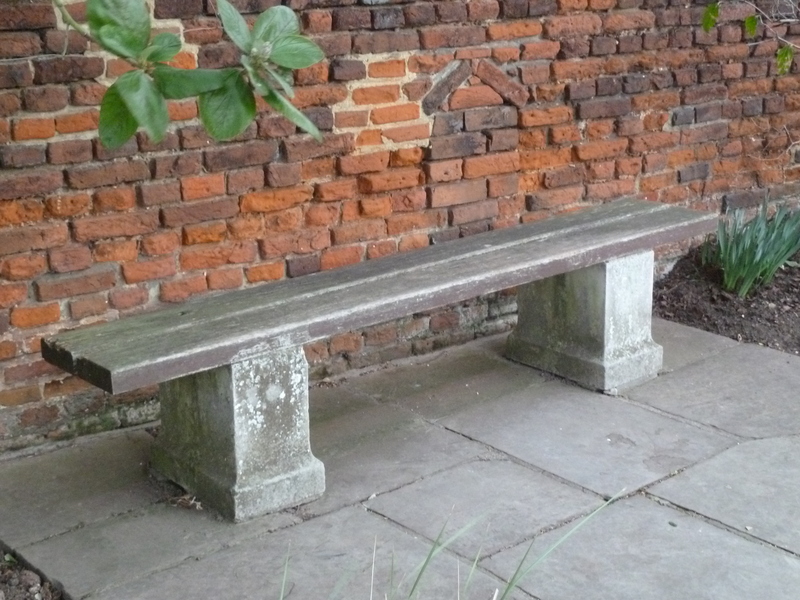 And so I started writing about two people who had different reasons for seeking comfort from being near the Ccathedral. I used the same format as the herb list I’d downloaded from the Cathedral website. I imagine this story being read as if each section had been written on a plant label, and it’s been designed so you could, if you want, read it any order. I’d love to see it in place in the garden – maybe one day! She spends the afternoon sitting against one of the ruined pillars in the herb garden, chatting with the plants. “We’re ladies who lunch,” she tells the mint. Since the accident, he finds it difficult to meet people’s eyes. He comes to the Cathedral to run his hands over the ancient stones, pressing his palms so deep against the sharp edges he draws blood. Only then does he feel better. 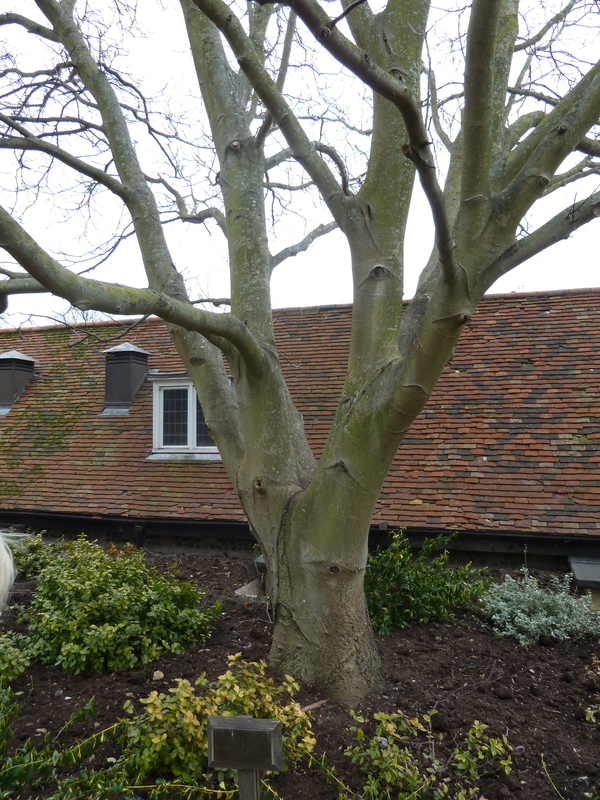 She has everything her mother dreamt of for her – farmhouse near Faversham, a rich husband who’s hardly there, committees. Only children are missing. She watches the school parties at the Cathedral, likes the naughty ones best. Imagines how good it must feel to be cross at them. He’d been driving past two horses in a field full of daisies, laughing at how they galloped just for the joy of it. He saw the flashing lights, of course he did. But he thought he might gallop across the tracks in time. But then the train reared up, and his heart. Since the hospital visits began, she’s stepped over into a different world from her family and friends. After two hours of machines and chemicals, she longs to fill herself up with the scent of these plants. To inhale the life in them. No, his heart said. So loudly he remembers thinking the driver of the train must have heard it too. Otherwise why would he have looked so scared. Now the sound deafens him, ringing in time to the Cathedral bells. No. No. No. She lies flat out on the grass, trying to remember the last time she was touched, flesh to flesh. Although they are careful to warm the metal instruments first, even the nurses settle her down with plastic covered hands these days. A lucky escape. That’s what the lawyers said when he was told that charges wouldn’t be pressed. His medical notes were used as proof that he’d suffered enough. He doesn’t drive anymore, but the Cathedral is only a forty minute walk away. He’d do it barefoot if he could. Kindness comes from unexpected places. Last week as she was walking through the Westgate in the rain, a teenager handed her a black umbrella and walked on. Probably he’d taken it from a bin, because it was broken, but she doesn’t care. She smiles every time she uses it. He hasn’t been able to work since his wife – never strong – left him. His only routine is to come daily to the Cathedral. He wishes he could just let go of it all, allow the wind to take him any way it wants. A routine medical check and it turns out she’s dying. She takes courage from all the hot-country herbs she sees battling against the Kent frosts. Because if nothing is as she expects, then maybe she can be surprising too. He’s been following the plant’s trail for weeks. Sees the gardeners try to contain it but the next day, a shoot pops up in the next bed – fragrantly confident of a warm welcome. He imagines the plant parties that take place after dark, roots tangled together deep under the earth. If she puts her hands on the soil, she swears she feels the plants vibrating against her skin, letting loose a cacophony of emotion– sorrow, anger, joy, fear – that threatens to overwhelm her. But like the prince’s kiss, it wakes her up after all those years. ‘Excuse me,’ she says, and he looks up, recognizing her. The woman who sits over by the pillar. ‘I think I know you,’ she seems nervous. ‘You’re always here too,’ he says. ‘You look different,’ she says. ‘You too,’ he says. They’re so easy to overlook. Two ordinary people going off to have tea in a nearby café. But then they stop, look back at the scaffolding on the tower. ‘I’m scared,’ she says. ‘Everyone is,’ he says. And yet they keep on walking. And here’s Jocelyn, gamely freezing in the campanile gardens as she beautifully reads an extract from T S Eliot. You may need to turn the sound up, she is competing with the wind! 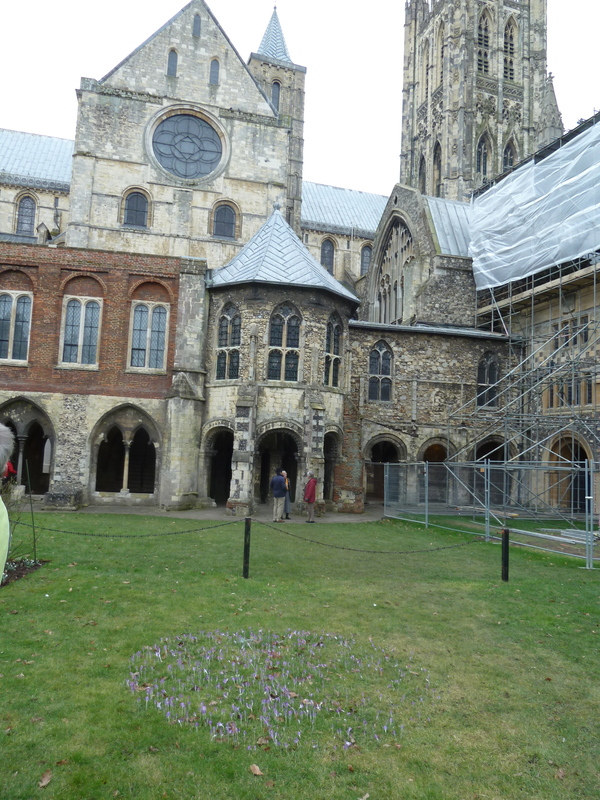 This entry was posted in Uncategorized and tagged Canterbury, Cathedral, T S Eliot. Bookmark the permalink.